Through these pages you'll learn about our parks and products we offer. Thanks for visiting our Web store. 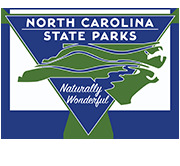 I'm sure you'll discover, as we have, that North Carolina's state parks system is Naturally Wonderful! If you have comments, questions, suggestions, or complaints about any of our products, we want to hear from you! Shipping Information: Orders are shipped via the U.S. Postal Service or UPS. There are no additional fees. Products are typically shipped within 2 to 3 business days from placing your order. Payment Methods: We only accept VISA, Mastercard, and Diner's Club for payment on this Web site. Return Policy: All sales final. Only damaged or defective items can be exchanged or returned. Please contact us at parkinfo@ncmail.net for instructions.